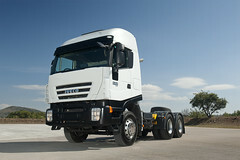 o 2, 3 or 4 axles with partial or all-wheel drive (4x2, 4x4, 6x4, 6x6, 8x4 and 8x8). These features can be combined with a wide range of frames, suspensions and final drive ratios. The wealth of variants means you will always find the right vehicle for your mission: in total, the New Trakker is available in over 1,700 factory versions. The agility and robustness of the Trakker also make it the ideal choice for rescue services (fire and rescue, civil protection) and defence applications.